I enjoy genre mash-ups. When done right, they highlight the strengths of both genres, and that’s a hard thing to pull off. Think horror-comedies like Ghostbusters or Zombieland, or science fiction mysteries like Asimov’s I, Robot stories. Or zombie westerns like the Bloodlands novels, or Dead Reckoning. But sometimes a mash-up is so brilliant I have to buy it immediately That’s what happened with The Last Policeman, a police procedural set in Earth’s last days. 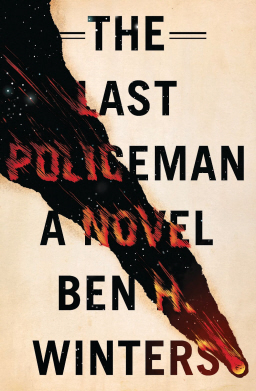 The Last Policeman presents a fascinating portrait of a pre-apocalyptic United States. The economy spirals downward while crops rot in the fields. Churches and synagogues are packed. People all over the world are walking off the job — but not Hank Palace. He’s investigating a death by hanging in a city that sees a dozen suicides every week — except this one feels suspicious, and Palace is the only cop who cares. Now there’s an original use for an apocalyptic setting. Give me a impending extinction-level event and a relentless investigator too stubborn to give up, and you have my attention. I bought this book after reading the first two paragraphs of the plot summary, and for a jaded book purchaser like me, that’s saying something. Ben H. Winters is a New York Times best-selling author and an Edgar Award nominee. His last novel was Bedbugs. The Last Policeman was published by Quirk Books in trade paperback July 2012. It is 316 pages and priced at $14.95 ($14.95 for the digital edition). If, er, When you actually read it let me know — this jaded policeman might actually read his first apocalyptic novel. I just said I bought it; I didn’t say I had time to READ it. I’m still not finished with the last two books I blogged about, PIRATE FREEDOM and THE COMPLETE JOHN THUNSTONE. If you want to review it, say the word and it’s yours. I’ll have it in the mail for you by Saturday. This sounds really cool — and I just know that Jason is the perfect man to review it for us. Any other votes? C’mon people — put the screws to Waltz! I read it last year and it is very, very, very good. It’s a compelling read, with a believable lead character. I’m not usually a reader of ‘literature’ but this is what I imagine a literate genre book would be. Plus there are enough hooks set up to carry the story into the sequel. Thanks for the mini-review Harry! With the apocalypse on the horizon, it surprises me there will be sequels. Guess I’ll have to read it to see how they pull that off. Unless I can get Waltz to read it for me. I give myself even odds to defeat you at our annual Heroscape game at E.E. Knight’s, Mr Waltz. But I don’t know if I can beat John Hocking!